Using manure as fertilizer is centuries old. With organic gardening and organic lawn care on the rise, the question of using manure as a top dressing or as a garden fertilizer may have crossed your mind. With manures in general, you have two basic choices: Composted manure or raw manure. Horse manure and cow manure may be the the most common, but goat, poultry, rabbit, and others can be used. Using horse manure seems to be less offensive than using cow manure, at least for some people. The reason for this is probably because horse manure is in pellet form, while fresh cow manure is basically a wet cow patty. 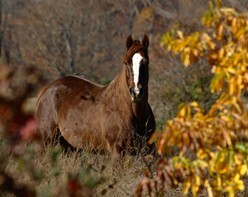 Information about composting horse manure is gaining in popularity. Small farms are a good source of quality manure and it can often be obtained for free. Compost manure products are also available at many lawn and garden stores in various size bags and at different prices. The principle question for most people is one of safety, especially concerning raw manure as fertilizer. This and other concerns are addressed on this page. Important Note: The term “raw manure” is not necessarily referring to manure that is fresh from the animal. Who really wants to work with that? Rather, aged manure is still considered raw. Aged manure is manure that has sat for a considerable time, is dry, and has lost its offensive smell. It has already broken down considerably and is far less offensive to work with. Therefore, using aged manure as fertilizer is the better choice over fresh, in my opinion. The bottom of the page offers methods and places for obtaining manure as fertilizer for your garden. Manure is part of the "circle of life", to repeat an old cliche. Using manure as fertilizer has been part of organic crop production for centuries and is possibly the original organic fertilizer. Both raw and composted manure can alter poor soil structure and build fertility. They add valuable organic matter that feed the soil fauna, especially soil microorganisms. Healthy soil is living soil and is the foundation of healthy plants. Healthy soil performs many beneficial functions, including the breaking down of soil contaminates. Healthy, living soil also enables plants to fight off diseases much easier. Compost manure is been subjected to heat that kills harmful bacteria and is considered safe. However, there has been research that suggests that E. Coli is slightly more tolerant of the heating process than previously thought. However, I have yet to see any conclusive research that will convince me to take any special precautions with compost. The overcrowded, unsanitary conditions of the nations largest slaughter house feedlots. The two elements above combined with the method of operation of giant feedlots that supply beef to most stores in America, has allowed for the growth of resistant forms of E. coli. As far as I know, the deadliest forms of E. coli is not found on country farms where grass is the main staple. This, in part, is because corn is not the natural food for cattle, but is fed exclusively in feedlots because it is cheap (government subsidized) and puts weight on quickly. It is important to know the the nitrogen and nutrient content when using manure as fertilizer. The nutrient content will be affected by what the animal has eaten. Hay fields that were fertilized with high nitrogen fertilizers for faster growth may contain higher levels of nitrogen. Fields not regularly fertilized may result in lower amounts of nutrients. The following manure nitrogen levels are only rough estimates based on several factors, as stated above. It is also important to know that wet manure traditionally delivers less nutrients than dry manure, as seen in the scale below. When using manure as fertilizer, be aware that manure contains salt. The amount of salt depends on the type of feed given to the livestock. Over time salt levels could possibly build up in the soil. However, frequent light rain or an occasional heavy rain will usually be enough to wash excess salt below the grass root zone. In dry climates or around salt sensitive plants, there still may be a need to monitor salt levels. 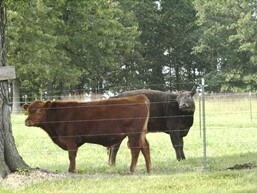 Heavy metals present in manure may occasionally exceed healthy levels. The highest metals are found in composted sewer treatment wastes called bio-solids. While this is not livestock manure, it is occasionally used in gardens. Milorganite is a popular brand of fertilizer made from composted sludge from treatment facilities. Although metals are monitored closely, bio-solids now have only a limited use in food plot fertilization. Their main use is in turf situations. Weed introduction is another concern when using raw manure. Weed seeds the animal consumed can find a new home in your lawn or garden. Repeated use of manure, whether composted or raw, can acidify the soil. This can be a benefit if your soil leans slightly toward the alkaline side. If your soil is already acidic, monitor soil conditions regularly. Applications of lime or wood ashes may be needed to correct acidity problems. Where edible portion of crops touch the soil: A time delay of 120 days is advised from the time the manure entered the soil to the time the plants are eaten. Where edible portion of crops do not touch the soil: A time of 90 days is advised from the time the manure entered the soil to the time the plants are eaten. Use only livestock manure. Do not use cat or dog feces. Some third world countries have been known to use human waste as fertilizer. This is very dangerous, so if visiting those countries, research how uncooked vegetables were grown before eating them. Guano, which includes bat and sea bird waste, is not considered composted, but rather it is considered as raw, aged manure. When used in a vegetable garden, the same time limits apply. Your garden weeds may increase with the use of manure as fertilizer. To a certain degree, weed seeds consumed by the animal may germinate and sprout in your garden. Therefore, it is best to add all the manure needed at the end of the year or at least by the beginning of the year before planting. Do not add more after that. Remember, too, that many of the disease problems associated with commercial vegetable growers that have gotten people sick in recent years is due to the presence of pathogens in the irrigation water. Many use a common irrigation channel. It could have come from water draining directly into the irrigation channels from nearby dairy operations. If so, pathogens passed through the sprinkler system directly unto the vegetables shortly before harvest. I plant a vegetable gardens every year, as well as, many of my friends. Most take great pride in their gardens and have the planting times, weed control, and harvest down to a science. These small gardens produce food for our families with a lot left over to share with others. One particular friend has a garden approximately 2000 sq. ft. in size. He rarely uses standard fertilizer, but for years has added horse manure as fertilizer. He also uses special cover crops (referred to as "green manure") that are grown just to be rototilled back into the soil. Green manure is a popular way of adding and replacing nutrients. Using manure as fertilizer is common in rural areas. In fact, most of the people I know with small farms or who live near a farm has used raw livestock manure in their gardens. I admit that this may seem strange or even barbaric to some city folks who have never planted a garden. This was new to me as well before I moved to rural southern Missouri. You should probably know that many large crop farming operations replace lost nutrients and organic matter by the use of manure. For example, turkey or chicken liter turned into the soil is an excellent and inexpensive way of restoring nutrients. Using manure as fertilizer will always be an acceptable method of replacing nutrients. When using raw manure as fertilizer or as an organic top dressing for your lawn, some of the concerns are the same as with gardens; that being the transfer of contaminates from the manure to people. Since the grass is not consumed as food, that part of the equation is no longer a concern. However, the concern is primarily with children and pets. Small children that play in the lawn may pick up objects that have been lying in the lawn after the manure was applied. Dogs, as horrible as it sounds, are well known for eating animal manure. Aged manure lacks the odor of fresh manure and may be less appealing to animals. Composted organic matter, including manure, is far safer to use around young children or pets. From a lawn care perspective, nutrient content is important. Some grasses require more nitrogen than others and many types of manure cannot deliver the amount of nitrogen needed. Review our page on developing a fertilization program for more information on the nitrogen needs for grass. For this reason, some manures are only used for altering soil structure and adding organic matter than as a fertilizer. Low nitrogen, low maintenance lawns may do okay using manure as fertilizer. An important benefit, however, is that manure is food for billions of soil microbe. Healthy populations are necessary for plant health. A lot of people don't realize that even many synthetic fertilizers require the work of soil microbes to break down the outer coating to release the nutrients. The job of soil microbes are immensely important and are the secret combatants that release nutrients, fight turf diseases, build healthy soil, and cleans the soil of contaminates. Manures, including bio-solids, guano, and others, are important tools for cleansing the soil of harmful contaminates, a process called bio-remediation. 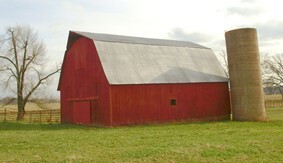 Most farms have at least one barn and is the best place for gathering manure. Farmers know the barns that provide shelter for animals need to be cleaned regularly. Most would love to have someone volunteer to scoop out manure and haul it away. Horse, goat, and rabbit manure are in pellet form, with “horse apples” obviously being the largest. Poultry manure is an excellent fertilizer. "Nutrients Plus" is a company that makes professional organic and organic/synthetic fertilizers that utilizes composted chicken manure as the base. I used it in my business. Poultry manure and turkey manure (called "litter") resemble duck and geese droppings. It takes a lot of chickens for you to collect a sizable amount of poultry manure. Large egg farms are the best places to gather the amount needed to fertilizer a large garden. Turkey farms are also a good place. Disposing of manure on commercial farms is always a concern for the farmer. Be sure to wear gloves and a paper face mask when shoveling manure. In barns, much of the older manure will have crumbled into powder form. Once it has dried it breaks apart easily. Also wear a old pair of shoes, preferably rubber boots that can be sprayed off with a hose after use. Compost top dressing is a fairly new practice for home lawns. Get helpful advice and step by step directions for the best possible results.